Many individuals living with dementia forget to eat or become overwhelmed at the thought of preparing meals or making choices about what to eat. Rather than care partners taking over every related to meal time, we can often modify the home environment to provide structure, but also gives the person independence, self-esteem and the knowledge that they are respected. People with dementia should be given every opportunity to make informed choices about their care, leisure time, clothing, food and anything else that affects their life. Providing choices related to meals may different for each person, depending on their cognitive and psychical abilities. Choose two breakfasts, two or three lunches and dinners with simple recipes, and the person can make whichever recipe they want for each meal. At any given meal, provide the person with a choice between two meal items such as eggs and toast or oatmeal for breakfast. If verbally telling them the options makes it difficult for them to decide, provide photos of each meal and let them point to and choose which meal they want. Provide a meal the person likes, but allow choice between two different drinks at each meal. For snacks, create a labeled and contained “Snack Area” in the pantry and in the refrigerator. Place three to five different snack items in the container to choose from. In the “Snack Area,” provide photos of two to three items that make up a snack so the person can choose a card and match the items they need to the card. Choose a simple recipe and set up a work area with already measured ingredients and follow the pattern of putting one ingredient in a bowl, stirring, putting in the next ingredients, stirring, etc. until all ingredients are in, and the ingredients are stirred and ready to eat or bake. Many people with dementia have problems seeing the food on her plate, which negatively influences their ability to eat. As individuals age, changes in the eye’s crystalline lens result in reduced contrast and color saturation (Figuerio, 2001). In addition, people with Alzheimer’s disease have difficulty judging colors and contrast, depth perception, and spatial orientation (Zgola, 1999; Calkins & Chafetz, 1996). Contrast and lighting can play important roles during meals, as they have a significant role in the character of the visual environment (Calkins & Chafetz, 1996). Dim lighting is challenging for elders, as all food items may appear to blend together, making it difficult to identify or put food on onto utensils. Poor contrast at the table setting, for example, a white plate on a white table cloth, reduces the ability to see the plate. I have conducted research that has shown that by increasing light intensity and contrast at the table setting, corresponding increases in elders’ intake can occur (Brush, Meehan, & Calkins, 2002; Koss & Gilmore, 1998). I suggest always using a placemat that contrast from the table and the plate. So for example, if you use white plates, use a brightly colored blue or red placemat that stands out and helps the person with dementia to see the plate and focus attention on the meal. Although it may seem easier and quicker to take over meal time tasks for someone with dementia, we are not really helping them. When we do everything for them, we take away their independence and self esteem. 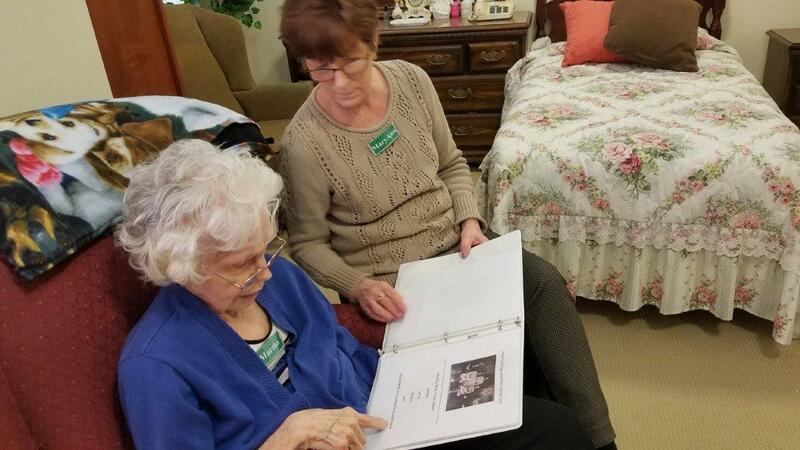 By looking for ways to change the home environment and provide memory supports, we help them succeed, contribute to the home, and maintain their dignity.